On February 14, 2014, President Obama's issued an Executive Ordering requiring certain federal contractors and subcontractors to pay an increased hourly minimum wage as mandated by the Secretary of Labor, who was also to determine increases to the wage rate on an annual basis. 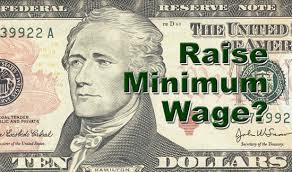 On Wednesday September 16, 2015, the Secretary of Labor Announced that, effective January 1, 2016, the new minimum wage will be increased from $10.10 to $10.15 per hour and that the rate for tipped employees will rise from $4.90 to $5.85 per hour. · is a contract in connection with Federal property or lands and related to offering services for Federal employees, their dependents, or the general public. In addition, the wages of the workers under the contract must be governed by either the Fair Labor Standards Act, the Service Contract Act, or Davis Bacon. A "new contract" is defined as a new or replacement contract that results from a solicitation issued or after January 1, 2015, or that is awarded outside the solicitation process on or after January 1, 2015. For contracts covered by the Service Contract Act or Davis Bacon, the Rule applies only to prime contracts at the thresholds specified in those statutes. For procurement contracts where workers' wages are governed by the FLSA, the minimum wage applies only when the prime contract exceeds the micro-purchase threshold as defined in 41 U.S.C. § 1902(a), or $3,000. The Rule provides that subcontracts are covered using the same "new contracts" test set forth above for prime contractors. Additionally, the minimum wage requirement applies only to contracts where the contract is performed, in whole or in part, within the United States. The DOL estimates that "nearly" 200,000 American workers will benefit from this new minimum wage.